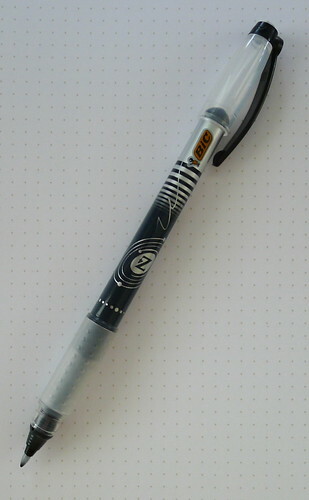 The Bic Z4 Porous Tip pen was one of the first few pens I reviewed on The Pen Addict. It has long been a favorite of mine, and I wish it was more widely available. Heck, I wish all pen brands would have more porous tips available. I love the feel of the plastic tip on the paper, and the sharp dark lines it creates. Yes, it is a much wider tip than I normally use, but is very versatile. If you happen across one be sure to try it out. Update: I have been asked where to buy these. If you are lucky, you can find them at one of the big office supply stores like Staples. I checked on Amazon this morning, and they have the new body style for $9.95/dozen, which is a great deal. Posted on August 18, 2011 by Brad Dowdy and filed under #onepenoneday, Bic, Z4.